Posts on our bed and breakfast accommodation blog about Jesmond and Spital Tongues in Newcastle upon Tyne, NE2. This is Tomorrow Festival 2019 takes place on Friday 24th, Saturday 25th and Sunday 26th May 2019. This is Tomorrow Festival is being held at Exhibition Park, Claremont Road, Newcastle upon Tyne, NE2 4PZ. Artists performing at the festival include Foals, Noel Gallagher’s High Flying Birds, The Vaccines, Nothing But Thieves, Editors, The Pale White, Glasvegas and The Stereophonics. If you are looking for bed and breakfast accommodation for your visit to Newcastle upon Tyne our bed and breakfast room availability and prices are here: online booking. 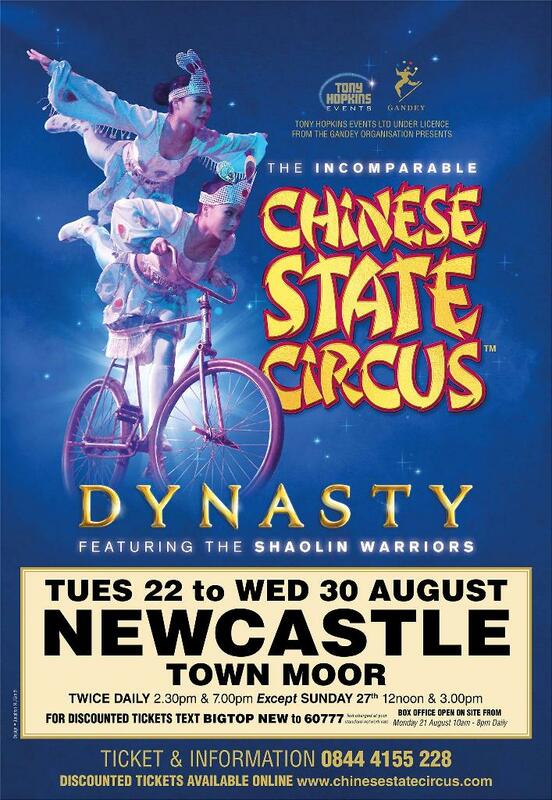 If you are staying at our bed and breakfast accommodation between Tuesday 22nd and Wednesday 30th August 2017 then you may be interested in going to see the Chinese State Circus which will be at Newcastle upon Tyne‘s Town Moor. Performances are twice a day at 2:30pm and 7pm. 12 noon and 3pm on Sunday. If you are travelling to the Town Moor from our bed and breakfast accommodation the closest Metro station is West Jesmond which you can reach directly along the yellow line from our closest station South Shields. For more Newcastle upon Tyne related posts on our blog click here: Newcastle upon Tyne. Newcastle Foodies Festival takes place this Friday 2nd, Saturday 3rd and Sunday 4th June 2017 at Exhibition Park, Claremont Road, Newcastle upon Tyne, NE2 4PZ. Tickets for Newcastle Foodies Festival at Exhibition Park cost £7 but you can you the special offer discount code NEWCASTLE241 to buy one and get one free. Watch Great British Bake Off Winner 2016 Candice Brown in The Cake & Desserts Theatre as well as Top Chefs such as Omar Allibhoy of Tapas Revolution cooking their signature recipes in the Stoves Chefs Theatre with MasterChef’s Juanita Hennessey, Tony Rodd and local Northumberland lass & MasterChef Finalist 2017 Lorna Robertson. We will also be joined by Actress, Chef & Author of Milly’s Real Food Nicola ‘Milly’ Millbank, Great Vegan Bake Off Winner Katy Beskow AKA ‘Little Miss Meat Free’, Author of One Pound Meals Miguel Barclay & Dan Coombes better known as ‘The Curry Guy’. Feast in the Street Food Avenue; learn to bake in the Cake and Bake Theatre with Charlotte White ‘The Burlesque Baker’; enjoy afternoon tea in the Vintage Tea Tent; taste wine, champagne and craft beer in the Drinks Theatre; buy from local producers in the Artisan Market; kids enjoy the Children’s Cookery Theatre; live music on the Unsigned Music Awards Stage; enter the Chilli Eating Competition; refreshing cocktails from the Bar Bus, Pimms Teapot & Appleton Estate Rum Bus and have a fun day out in the VIP experience. The festival is open on Friday 2nd June from 11am until 7pm, Saturday 3rd June from 11am until 7pm and on Sunday 4th June from 11am until 6pm. If you are looking for bed and breakfast accommodation for your visit to Exhibition Park in Newcastle upon Tyne you can book online here: online booking. If you are staying at our bed and breakfast accommodation this weekend then you may be interested in The Late Shows – a free culture crawl around Newcastle upon Tyne and Gateshead where museums, galleries, artists’ studios, heritage sites and more who stay open late to put on events, exhibitions, performances and guided tours. The Late Shows take place on Friday 19th May and Saturday 20th May 2017. 36 Lime Street, 36 Lime Street, Newcastle upon Tyne, NE1 2PQ. The Biscuit Factory, Stoddart Street, Newcastle upon Tyne, NE2 1AN. Cobalt Studios, 10-16 Boyd Street, Newcastle upon Tyne, NE2 1AP. Grow to Glow (meet on the wooden bridge behind Ouseburn Farm, Newcastle upon Tyne, NE1 2PA. The Holy Biscuit, 1 Clarence Street, Newcastle upon Tyne, NE2 1YH. Hoults Yard, Walker Road, Newcastle upon Tyne, NE6 2HL. Jim Edwards Studio Gallery, 59 Lime Street, Newcastle upon Tyne, NE1 2PQ. Labyrinth, Unit 13, Foundry Lane Industrial Estate, Newcastle upon Tyne, NE6 1LH. Northern Print, Stepney Bank, Newcastle upon Tyne, NE1 2NP. Ouseburn Farm, Ouseburn Road, Newcastle upon Tyne, NE1 2PA. Seven Stories, 30 Lime Street, Newcastle upon Tyne, NE1 2PQ. St Dominic’s Priory, New Bridge Street, Newcastle upon Tyne, NE1 2TP. The Time Bandits, (meet by The Cluny, Lime Street, Newcastle upon Tyne, NE1 2PQ). Toffee Factory, Lower Steenbergs Yard, Newcastle upon Tyne, NE1 2DF. Tyne Bank Brewery, Walker Road, Newcastle upon Tyne, NE6 2AB. Victoria Tunnel, Ouse Street, Newcastle upon Tyne, NE1 2BE. Academy of Music & Sound, 191 High Street, Gateshead, NE8 1AS. BALTIC Centre for Contemporary Art, South Shore Road, Gateshead, NE8 3BA. Bensham Grove Community Centre, Sidney Grove, Gateshead, NE8 2XD. Dunston Staiths, Staithes Road, Gateshead, NE11 9DR. Gateshead Central Library, Prince Consort Road, Gateshead, NE8 4LN. Hatton Pavilion, Baltic Square, South Shore Road, Gateshead, NE8 3BA. Hidden Heights Creative Studio, Arch 4, Hymers Court, Brandling Street, Gateshead, NE8 2BA. Lawnmowers Theatre Company, Swinburne Street, Gateshead, NE8 1AX. Sage Gateshead, St Mary’s Square, Gateshead, NE8 2JR. Shipley Art Gallery, Prince Consort Road, Gateshead, NE8 4JB. Bessie Surtees House, 44 Sandhill, Newcastle upon Tyne, NE1 3JF. The Cathedral Church of St Mary, Clayton Street West, Newcastle upon Tyne, NE1 5HH. The Cathedral Church of St Nicholas, St Nicholas Square, Newcastle upon Tyne, NE1 1PF. Dance City, Temple Street, Newcastle upon Tyne, NE1 4BR. David Fry Pottery Studio, 69 Westgate Road, Newcastle upon Tyne, NE1 1SG. Discovery Museum, Blandford Square, Newcastle upon Tyne, NE1 4JA. Maple Terrace Masonic Hall, Maple Terrace, Newcastle upon Tyne, NE4 7SE. NBS – The Old Post Office, St Nicholas Street, Newcastle upon Tyne, NE1 1RH. Newcastle Castle, Castle Garth, Newcastle upon Tyne, NE1 1RQ. North of England Art Club, 55 Westgate Road, Newcastle upon Tyne, NE1 1SG. Swing Bridge, Bridge Street, Newcastle upon Tyne, NE1 3RQ. 13 Grey Street, 13 Grey Street, Newcastle upon Tyne, NE1 6EE. BALTIC 39, 31-39 High Bridge, Newcastle upon Tyne, NE1 1EW. Breeze Creatives, Bamburgh House, Market Street East, Newcastle upon Tyne, NE1 6BH. Commercial Union House, 39 Pilgrim Street, Newcastle upon Tyne, NE1 6QE. Culture Lab, Newcastle University, King’s Road, Newcastle upon Tyne, NE1 7RU. Gallagher & Turner, 30 St Mary’s Place, Newcastle upon Tyne, NE1 7PQ. Globe Gallery, 47 Pilgrim Street, Newcastle upon Tyne, NE1 6QE. Grainger Market, Grainger Street, Newcastle upon Tyne, NE1 5QG. Great North Museum Hancock, Barras Bridge, Newcastle upon Tyne, NE2 4PT. Laing Art Gallery, New Bridge Street, Newcastle upon Tyne, NE1 8AG. The NewBridge Project, Carliol House, Market Street, Newcastle upon Tyne, NE1 6NE. Newcastle City Library, 33 New Bridge Street West, Newcastle upon Tyne, NE1 8AX. System Gallery, 2nd Floor, 22 Leazes Park Road, Newcastle upon Tyne, NE1 4PG. Twisting Ducks Theatre Company, Broadacre House, Market Street, Newcastle upon Tyne, NE1 6HQ. The Cumberland Arms, James Place Street, Newcastle upon Tyne, NE6 1LD. Ernest, 1 Boyd Street, Newcastle upon Tyne, NE2 1AP. The Globe, 11 Railway Street, Newcastle upon Tyne, NE4 7AD. Jazz Café, 25-27 Pink Lane, Newcastle upon Tyne, NE1 5DW. Kommunity, Market Street, Newcastle upon Tyne, NE1 6BH. Vicolo / Tyneside Bar Café, High Friar Lane / Pilgrim Street, Newcastle upon Tyne, NE1 6QG. World Headquarters, Curtis Mayfield House, Carliol Square, Newcastle upon Tyne, NE1 6UF. If you are looking for an organised firework display to attend this November then you may be interested in the display that is going to be held at Newcastle Cricket Club on Osborne Avenue, Jesmond, Newcastle upon Tyne, NE2 1JS on Sunday 3rd November 2013. 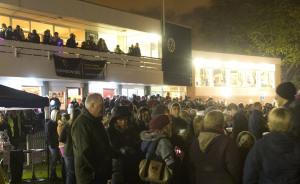 The gates open at 5pm; entertainment including face painting starts at 6.15pm and the firework display starts at 7pm until 9pm. You can get discounted tickets for the display here: Firework Display At Newcastle Cricket Club in Jesmond. Using that link adult tickets are £4 and children’s tickets are £2. More information can be found on their website: Newcastle Cricket Club in Jesmond Homepage. For more Newcastle upon Tyne related blog posts click here: Newcastle upon Tyne. For more local discounts and special offers on our blog click here: local discounts and special offers. For more blog posts about local events click here: Events. If you are looking for hotel accommodation for your visit to Jesmond, Newcastle upon Tyne our bed and breakfast availability is here: online booking. Room information including photographs can be found on the bedrooms page of our website.